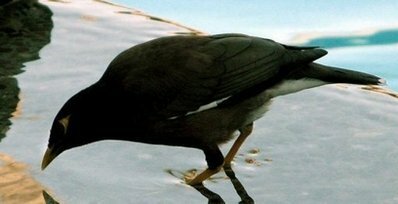 The AFP reports that a Taiwanese man has sued his neighbors claiming that they trained their mynah bird to swear at him and that the bird's relentless taunting caused him serious emotional distress. Few details were available, but it appeared that Wang Han-chin had previously complained to police that his neighbors were too loud, and he alleged that in revenge they had trained their bird to call him a "clueless big-mouthed idiot" when he left for work in the morning. Wang claimed that the bird's insults caused him serious distress, and had affected his concentration at work to the point that he had somehow burned himself. Prosecutors apparently declined to charge the neighbors with anything "due to insufficient evidence linking the bird to his injuries," and that seems to have led to a civil lawsuit. In a similar case in 2006, which also shows that my database of "similar cases" is getting pretty comprehensive, a 78-year-old Pennsylvania woman charged one of her neighbors with repeatedly meowing at her in retaliation for complaining to police about their cat's infiltration of her flower garden. Alexandra Carasia also claimed the conduct had caused her emotional harm, and even used the word "torture" to describe her experience, completing the final degradation of that word from something that once meant "heinous war crime" into a term that can also encompass repeated meowing. That case was also similar in that the charges were quickly dismissed.